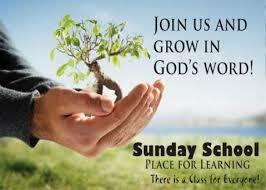 We offer Sunday School classes for all ages. As soon as your child can sit by themselves in a high chair we have a class for them. Even from the earliest ages we teach the scriptures and the good news of Jesus Christ. But we have classes for adults as well. And all of our classes are taught by committed and godly teachers. Don’t miss out on the opportunity to gain first-rate Christian education. If you send your children to regular school 180 days a year, shouldn’t you send them (and you) to Sunday School 52 days a year?